With a luxurious, elegant look and a stunning cut-out design, this Angel Wing ornament favor from our new Heaven Sent Collection will elevate your celebration tables to new heights! Our magnificent Angel Wing is made of MDF wood and hand painted in a white color. The Angel Wing features a beautiful intricate cut-out design. Each Angel Wing comes with a white satin ribbon for hanging in a special place. The Angel Wing ornament is packaged in a burgundy box with a clear acetate top to show off the item. There is a 'For You' message on the top of box. 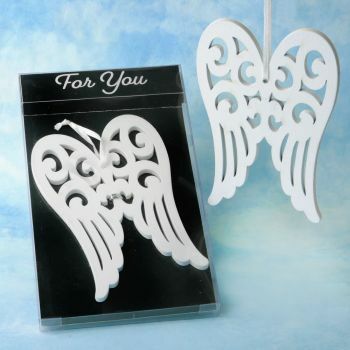 Decorate your baptism, communion or Christian themed event tables with an angelic touch. Your guests will be delighted to take these Angel Wings home as a reminder of the special time shared with you.